If you need a cool backpack then this Doctor Who Tardis Time Lord backpack. This maybe not the backpack you expect but that makes this an amazing backpack. 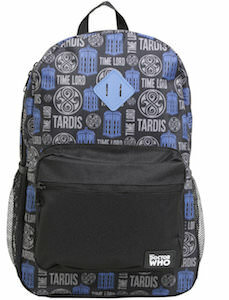 The backpack has a design with Gallifrey symbols, the Tardis, and words like Tardis and Time Lord. And you will find the same design on the adjustable straps too but the front pocket is just simple and black and that makes this a cool bag with a side pocket for your water bottle. The Doctor Who backpack is 12 x 17 inches making it nice and big so that it can keep a lot of stuff with you on you back. 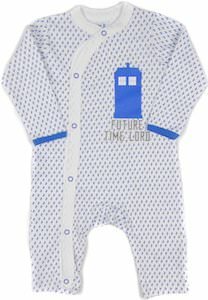 If you have a newborn child that is destined to be the next Doctor Who then you should start dressing them in this Tardis Future Time Lord pajama. This baby sleepsuit is a one piece and footless and with buttons on the front to make it easier on you to put it on. The baby onesie is white and on it, you can see little blue lightning bolts and in big, you will find the Tardis on the front with below it the text “Future Time Lord”. You can get this Doctor Who baby pajama in sizes 0 – 24 months and it is made from 100% cotton for ultimate comfort of the future Doctor Who. Now there is Doctor Who wallet that can replace that boring black wallet you use normally. 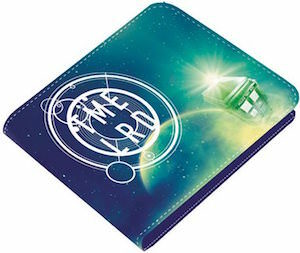 This bi-fold wallet shows the galaxy on it and in a corner you can find the Tardis with the light on top shining bright and then there is in big words “Time Lord” on the wallet so that everyone knows that this wallet really belongs to the Doctor. Inside de wallet, there is plenty of room for cards, cash, and a note or to. And this Doctor Who wallet is made from faux leather so that it is great for vegans as well. 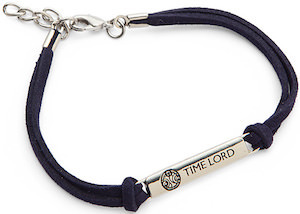 If you would be Doctor Who then of course you would wear this bracelet as it tells the world that you can travel in time. This officially licensed Doctor Who bracelet is made from leather with in the middle a steel plate made from 316L surgical stainless steel that shows a symbol from Gallifrey and beside it the text “Time Lord” and that of course would look amazing on your wrist. And yes this bracelet has a clasp and a little extender so that you can make it fit perfectly. Sure this Doctor Who jewelry does not show the Tardis but that is OK as it still look amazingly cool. This Time Lord beanie hat is just what Doctor Who needs for those cold days and if the Doctor is not near then you can wear this fun winter hat. 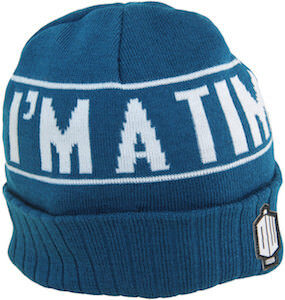 The Doctor Who beanie is blue and in white it the hat says “I’m A Time Lord” and it even shows the Tardis and the Doctor Who logo. Made from 100% acrylic this hat is just perfect for you or you Doctor Who loving friends. No need to wear that ugly boring beanie hat you wore yesterday any more because now you can have the Doctor Who winter hat you deserve. This black t-shirt is all about the time lords. On the shirt you can see the words “Time Lords” on top and below that a seal that has the Tardis in the middle and around it written on the edge “ninth tenth eleventh twelfth” as the last 4 Doctor’s. The black Doctor Who t-shirt is made from 100% cotton and comes in men’s sizes Small – 2XL and yes ladies you can wear it to of course. A black and white t-shirt is something else then the usual blue Tardis and that makes this a great addition to any Doctor Who collection. This black women’s t-shirt is for the Doctor Who fans that want something different and vintage. On this t-shirt you can see the Tardis in the background and on top a banner that says “Doctor Who last of the Time Lords” and below that a banner that says “Since 1963” like the TV show and then there even is the current Doctor Who logo. And all that is surrounded by lines in different shapes to make it all look pretty busy but amazing. This Doctor Who t-shirt is made from 100% cotton and comes in women’s sizes Small – 3XL. 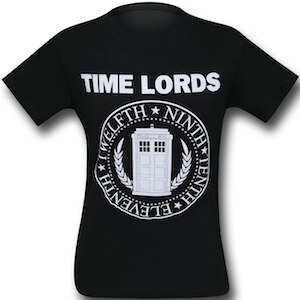 If you want a cool Doctor Who t-shirt then check out this Doctor Who Time Lords Since 1963 Women’s T-Shirt. Female Doctor Who fans can now get the perfect tank top for summer. 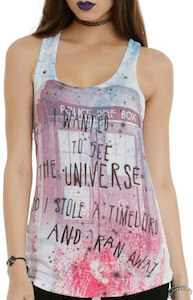 The back of this tank top is white in a racer style but on the front you find a picture of the Tardis in the background and some color splatters and most importantly the text “I wanted to see the universe so I stole a Time Lord and ran away”. Of course we would all like to be able to run away with a time lord like the Doctor but this tank top is probably the closest you get. You can get this women’s tank top in junior sizes XSmall – 3XL for the perfect fit. 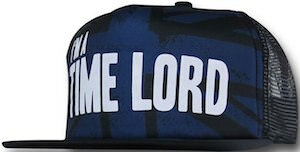 This Doctor Who snapback cap has a mesh back and a black front with on the black in dark blue a Union Jack with on top of that in big white letters “I’m A Time Lord”. Just wear this hat to feel closer to the Doctor and be sure that many people don’t even know what your amazing cap is all about. No more boring sports teams on your hat just wear one that is related to your favorite TV series Doctor Who. And this Doctor Who trucker hat snap back makes it easy to adjust to the right size so that many people can enjoy a Doctor Who I’m A Time Lord Cap. Why is the Doctor always a man? Maybe it’s time for a female Doctor Who and maybe if enough people start wearing this t-shirt then it happens. 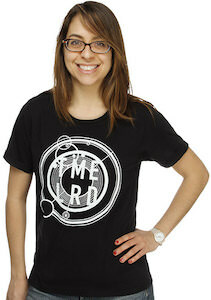 This black women’s t-shirt shows a Gallfrey style word with on top of that the text “Tme Lrd” witch of course means Time Lord. The t-shirt is made from 100% cotton and available in women’s sizes Small – 3XL and that means that many women can enjoy the feeling to be part of time lord history. 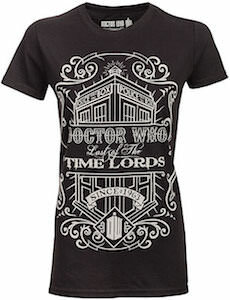 And why wait this Doctor Who t-shirt is specially made for all those whovian’s that do not own a time lord t-shirt yet. So come and get your Doctor Who Gallifrey Time Lord Women’s T-Shirt.